New London Town Hall is located at 375 Main Street, New London, NH 03257; phone: 603-526-4046. 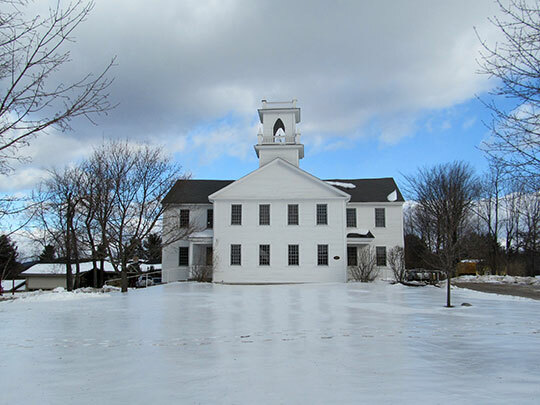 Photo: New London Town Hall (Old Colby Academy Building), ca. 1837, Main Street, New London, NH Photographed by user:John Phelan (own work), 2012, [cc-by-3.0 (creativecommons.org/licenses/by/3.0)], via Wikimedia Commons, accessed March, 2015. The first settlers arrived in New London following the Revolutionary War. Many were often veterans that fled the congestion of Boston for the open territory of New London. The town was granted its charter in 1779 and held its first town meeting with sixteen families participating. That first agenda was devoted to undertaking a survey of the town and building roads. The significance of assessing community assets and planning to meet future needs was as important then as it is today. From a small agrarian community with a few mills in the early 1800s, New London has become, in 150 years, not only a college town, but an important year-round and seasonal residential community, as well as a small regional commercial center offering goods and services for New London and the surrounding communities. From 1786 through 1940, New London's population was relatively stable, but after 1940 a four-fold increase in population took place over the next 60 years. Town of New London, NH, Master Plan Executive Summary, 2012, www.,nl-nh.com, accessed March, 2015.